By innovating faster using AWS, we can build better software for our customers, so they can do what they care most about: transforming the learning experience. Desire2Learn (D2L) is a software company that makes learning experiences better. The company’s cloud-based platform, Brightspace, is designed to be easy to use, flexible, and smart. With Brightspace, organizations can personalize the experience for every learner to deliver real results. The company’s platform predicts learner performance so organizations can take action in real time to keep learners on track. Brightspace is used by learners in higher education, K-12, and the enterprise sector, including the Fortune 1000. D2L has operations in the United States, Canada, Europe, Australia, Brazil, and Singapore. Although D2L originally hosted its applications in a data center, the company decided to migrate to the cloud several years ago. “As we thought about our needs for availability, security, and agility, the cloud seemed like the best choice,” says Oddson. “Once we made that decision, we had to consider what the best cloud technology was.” For D2L, the answer was Amazon Web Services (AWS). “AWS has been in the cloud industry the longest, and it has the most mature and developer-friendly environment,” he says. D2L runs its Brightspace platform and dozens of other learning applications on hundreds of Amazon Elastic Compute Cloud (Amazon EC2) instances. To store all its application data, the organization uses Amazon Simple Storage Service (Amazon S3) buckets. 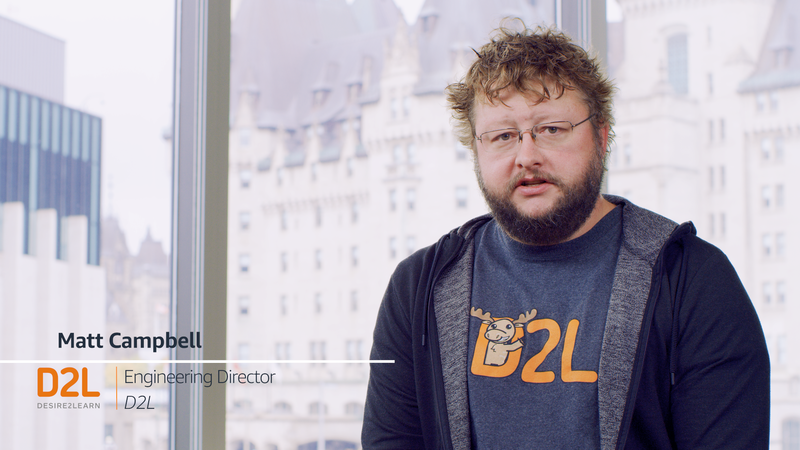 D2L takes advantage of Amazon Elasticsearch Service for searching and querying data, and relies on Amazon CloudFront as its global content delivery network (CDN) for all applications. In addition, the company utilizes Elastic Load Balancing for automatic distribution of incoming application traffic and Auto Scaling for automated scaling of instances up or down. “Using services like Elastic Load Balancing and Auto Scaling, we have a seamless way to automatically control availability and compute scalability,” says Oddson. D2L also has the ability to scale Brightspace and its other applications up or down, depending on the time of year. “Using AWS, we only need to be concerned about the compute cycles we actually use, as opposed to provisioning for peak loads and having idle systems during the months school is not in session,” says Oddson. To learn more about how AWS can help you manage your learning environment, visit our Cloud Computing for Education details page.